Whether it be a log home or a log cottage, all would agree that any such realization is a veritable work of art. Each log is carefully handcrafted, one upon the other, offering a uniqueness sure to please nature lovers and outdoor enthusiasts. We’re a far cry from the traditional log cabin of our ancestors, which most certainly served the purpose of the pioneers and settlers of North America. In fact, here is an overview of the evolution of these houses, from days past to today. For centuries, North Americans have been using readily available materials to build their homes. Abundant forests have led us to construct properties using this natural resource; however, over time techniques have obviously evolved. Despite this, in the northeastern United States, one can find log homes dating back as far as roughly 1640 that are still standing, having passed the test of time. Some of these houses have even resisted hurricanes thanks to their robust structural design! If properly maintained, the log home or cottage can serve its purpose for decades or even centuries. The fundamental rule for durability is always the same – one must be sure that the wood remains dry. It was in the early 1900s that the Scandinavian technique first emerged in Canada. It is, without a doubt, a refined method of log home construction which makes possible the combining of impermeability, insulation, solidity, beauty and longevity as noted by André Julien in his book (La maison de bois rond: technique de construction scandinave, André Julien, 2014). Our team has adapted the technique in order to further refine the methods and meet even stricter standards. While respecting the natural properties of the wood, the Scandinavian technique accounts for, and even benefits from, the natural settling which occurs during the drying process. In fact, the streamlining along the length of the logs and the corners with shouldering ensure the impermeability of the log home. Thanks to this approach, the construction techniques have been improved, the style has been refined and the quality, as a result, is superior. Joining together two wood styles, round and square, in perfect harmony, the Scandinavian post and beam structure is gaining in popularity. Its contemporary design in no way compromises the richness of its natural appearance. Combining these two styles results in a structure that is absolutely unique. Why such love of log homes? 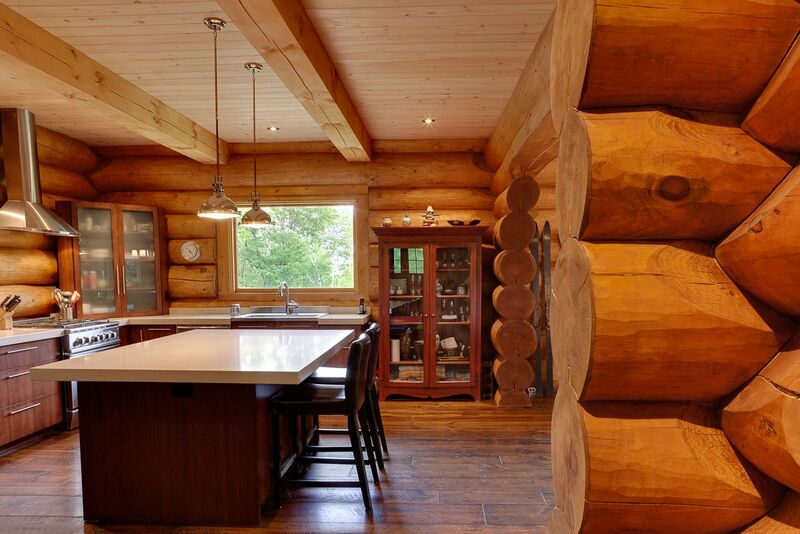 There are many reasons to fall in love with log homes. The warmth and beauty of such homes is, of course, a superb feature; however, from the construction point of view, this type of home is clearly advantageous thanks to the solidity of the structure which is resistant to the elements, is well insulated and is ecological. 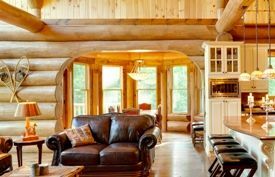 We have studied this subject and we invite you to discover 5 reasons to buy a log home. Below are the main distinctive factors of the Scandinavian technique. The selection of the wood (in our case, white pine chosen with care from forests respectful of the environment). – Without excessive spiral grain (in accordance with professional standards). – Choice of healthy trees, with smooth scrolling. – Diameter ranging from 12 to 18 inches, according to your specifications. Preparation : the logs are stripped of their bark and then hand-planed on our worksite in order to preserve the natural wood beauty. Adjusting of the logs: this is accomplished with precision using a special compass which allows the sculptor to reproduce the exact form of the bottom log onto the next log in order to insure a perfectly sealed joint. Sculpting : each log is meticulously hand-sculpted, one after the other. Insulation: A lateral groove in the centre of the log allows for the addition of a ‘P-Gasket’ type insulation during the reassembly of the house on its permanent location. This material serves as a cushion and a sealant. No additional fastening or insulating is required. Drying: this technique allows for openings in view of the settling of the wood due to drying. The house, during the drying process, settles with all its weight hence permanently sealing the joints. Ready to buy your log home? You’ve taken the time to read and study the subject and now you’re ready to take the leap? Perhaps you’re asking yourself if you should buy a log home “kit” or if you should go through a log home specialist. 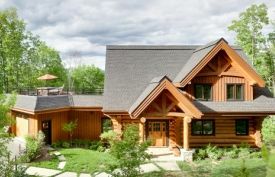 Before making a decision, we invite you to schedule a meeting today with a member of our team.A project of this nature requires the input of a company with experience in the finishing of Scandinavian type log homes. Your experts atHarkinswill ensure that your product will be built with care, finished in accordance with professional standards and that it will resist time and the elements. Until then, take a glance at some of our superb log home and cottage realizations..